Easily differentiated from the other two European Nyctalus species due to its smaller size (wingspan of 260-340mm), Leisler's bats possess dark brown rounded ears and snout. Its fur is bicoloured: dorsal dark brown and yellowish-brown at the throat. This species inhabits a variety of forests, both coniferous and deciduous. Tends to roost in tree holes, overgrown crevices and rotted cavities, though it can also be found in bat boxes and in the roof spaces of buildings. The anatomy allows Leisler's bats to fly very fast not only over large waterbodies but also below the canopy of trees. Its diet comprises of a wide variety of insects, such as moths, caddies flies and beetles. Known to cover long distances during migration (e.g. 1,000km recorded), typically in the southwest direction; species also sedentary in areas where winter is milder. 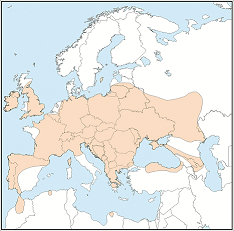 Leisler's bat is distributed across Europe from southern Scotland and Ireland along the southern edge of the Baltic Sea and parts of Mediterranean coast to western Russia. This species has been observed on Madeira, Tenerife and La Palma, and recorded in Morocco and Algeria. On the other hand, it has been absent from the south of Italy and eastern Spain. Threats include disturbance to and destruction of roosts in trees and buildings, and loss or degradation of foraging habitat.